Pam became the owner of The Bookloft in May, 2016. 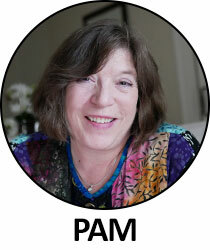 She reads and recommends many genres, from literary fiction to suspense to YA and cookbooks. See more of my Staff Picks here! If you are a fan of the suspense genre and haven't yet read Harlan Coben, you've got a lot to look forward to! I envy you having 30+ books to explore and discover. Coben's latest, Run Away, is up there with the best of them. An engrossing story filled with twists and turns and (possible) surprises. The story of what happens when God suddenly notices an individual human woman and falls in love with her. Funny, philosophical, deftly told. *Includes ruminations on ambles through the beauty of the galaxies and on that "alleged son" Jesus. A simple yet profound morality tale told in the form of a letter from Fox 8 to the Yumans who may receive it. Fox 8 learned to speak and read yuman by watching through a window where a lady was "saying Storys to her pups with luv . . . Then due to feeling luv, wud bend down, putting snout and lips to the heds of her pups, which was called 'goodnight kiss.'" The story starts simple and sweet with the above scene. THen the humans destroy the foxes' homes and scare away their food when they build a Mawl. A terrible incident occurs which causes Fox 8 to flee far from the encroaching city to find a new pack and a new life. A lovely, sweet, terribly sad, yet hopeful paean to the relationship between humans and nature. Comments: I picked up this book one morning after (yet another) mass shooting -- the second so far this month and it's only the 8th . . . Walker's words soothed me, and allowed me to cry for those I haven't met but who could so easily be mine. The Future Captured in a Heartless Fist begins, "Somehow it is left to us this most hopeful of generations to bear the unbearable." Walker's poems capture not only the present world turmoil, but the beauty of her spirit. Even those like me who are not typically poetry readers will be moved, challenged, and uplifted. "We are in swoon." Loneliness and melancholy weave a background hum with the beauty of the marshes dancing along as the melody of this song about love of nature and the wild things that dwell far from populated areas, out where the crawdads sing. Abandoned as a child, Kya raises herself with scants bits of help from a few others. She grows to know the salt marshes and becomes an expert on all that lives within them. A tale beautifully told. A dystopian future described through a literary-suspense thriller not quite like anything else I've read. The characters are vivid and true. The story is complete in itself, but I'm left wanting to know what happens next for Edie & West & Marta & Violet as they each move on from the closing scenes. Even the "villains" are well-rounded and empathetic each in their own despicable ways. I picked up this book to read just because of the title, but you may need a little more encouragement! It's about a century old battle between the magical beings of space and humans who have destroyed their own planet and are moving across the universe doing the usual things humans do while exploring new territory (mainly paying little head to the beings that already live there). It's sad and funny and charming, and all the characters are relatable. I loved it and devoured it in a day. Comments: Compelling, taut, suspenseful, sad . . . What would you do to save the ones you love? Would you choose family over the world? Is it worth saving the world if it means losing the ones we love? Unexpected twists and turns abound and the suspense is "edge of your seat." An entertaining "western" set in the bayous of Louisiana. Imagine Louis L'Amour with gender fluid characters and hippos instead of horses and cattle. I loved the characters in these stories! These are not my memories; not my words; but all are relatable. Some may make you cry; others rage. All are important. Many people should read this book and perhaps learn something from it. A taut, sparse tale of the choices we make for the sake of family and love. Filled with evocative descriptions, there is a memorable line on nearly every page. Like this: "She hoped for a rainbow but none came and she understood that she was an adult now and adults didn't hope for what they couldn't control, but accepted what was there -- the tree in the road, the woods, the soft thin blue of the sky." If you haven't read Christopher Moore, you've been missing some of the funniest, quirkiest novels of the past 20 or so years. This latest is classic Moore in terms of characters and humor, but with a 1940's noir vibe and some aliens from the Roswell, NM crash site . . . Up there with such Moore classics as "Lamb" and "Sacre Bleu," it includes a charming romance between a (not very) tough guy bartender and a five and dime waitress, and a reliable narrator in the form of a black mamba snake named Peter. Beautiful writing about some tough subjects like prison vendettas that spill over into the outside world, losing a parent, growing up, revenge. Violence permeates the pages. One of the last lines reads, "As Park headed for the door, someone started some music, something with bass in it, something wild and alive and free." This novel is all that and more. Wow.